The sharp edges on metal leaves on top of the pineapples pose a laceration hazard. Cracker Barrel Old Country Store of Lebanon, Tenn., is recalling about 1,500 decorative driftwood pineapples. The firm has received two reports of consumers cutting their fingers on the metal leaves on the pineapples, resulting in one injury that required stitches. This recall involves decorative driftwood pineapples. 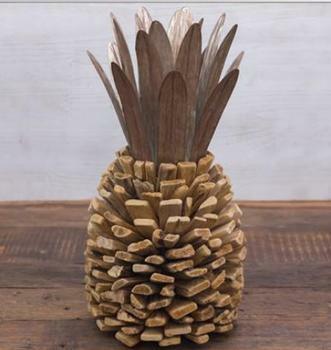 The pineapples are shaped from tan driftwood spikes, have spiked, galvanized metal leaves at the top and measure approximately 19 inches high by 9.5 inches wide by 9.5 inches in diameter. The pineapples, manufactured in China, were sold exclusively at Cracker Barrel Old Country Store locations nationwide and online at www.crackerbarrel.com from June 2018, through August 2018, for about $40. Consumers should immediately stop using the recalled pineapples and return them to any Cracker Barrel Old Country Store for a full refund. Online purchasers will be contacted directly. Consumers may contact Cracker Barrel Old Country Store at (800) 333-9566 Monday through Friday from 8 a.m. to 5 p.m. (CT) or online at www.crackerbarrel.com and click on “Product Recall” at the bottom of the page.